Genuine products can be used safely and should be easily replaced. This review is about item#46813067. It was adopted because cost performance was good compared with other purchase methods. Because it is a genuine product, it can be replenished with confidence. Moreover, monotaro is cheap. This review is about item#46813103. Again genuine products are safe. In the past I used cheap ones of recycled items, but the head is done in one year. I am very satisfied. I hope for good products from now on. This review is about item#46813076. This review is about item#46813121. I am extremely satisfied that you provided a satisfactory good product. After replacing the cartridge, if the printer malfunctions, considering the repair fee, it is better to replace the printer with a new one and dispose of the printer. 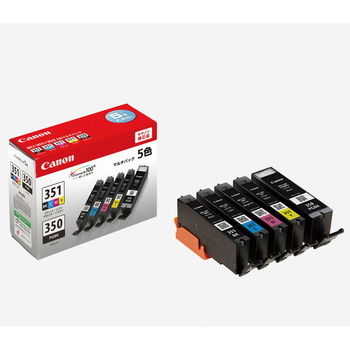 This cartridge can not be used for new printers and it is impossible to evaluate satisfaction. This review is about item#46813085. You can send it soon, so you can go without going to buy. I am multifunctionally saved. This review is about item#46813094. Printing sentences, photos, PDF etc. Inevitably, PGBK (350) is insufficient, BK (351) is too much, and the balance is bad. In the future, please consider another version. I am satisfied that the coloring is smooth and smooth printing is possible. In the future I will stay as it is. To your own personal computer at home. Anyway it is cheap with purity, it will be delivered immediately on the order date, It is about as early as buying it. Even if it is not a corporation, it will be delivered I am very appreciative. Purchased at 10% sale. It does not cost shipping fee, it can be purchased at low price. It is recommended. Since it is a genuine product, it can be used with confidence. Because the price is also cheap. The printing is finished cleanly at the time of printing, it is easy to use without blurring of letters, kasumi, color unevenness.